The aptly named Plumb Tub is, in case you hadn’t already guessed, a tub for plumbing. 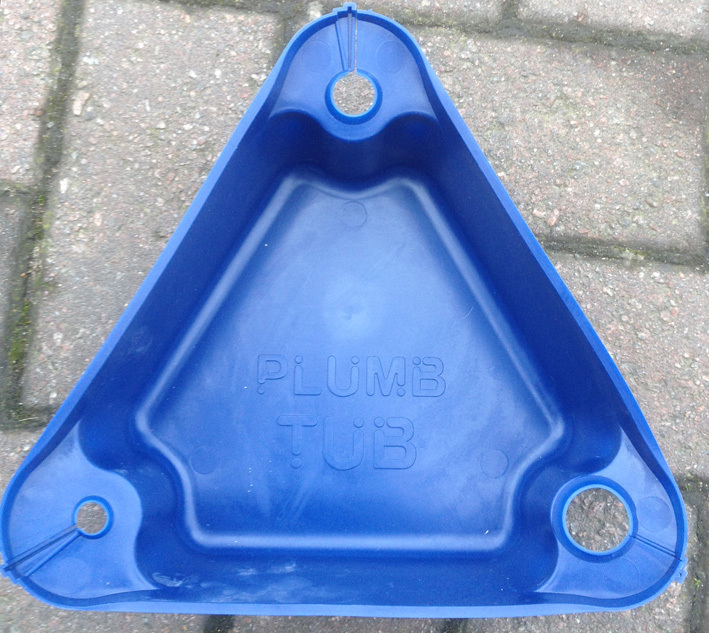 It’s not the sort of product that’s going to revolutionise the plumbing world but it is the sort of cheap, durable and easy to use knick-knack that is well worth having in your arsenal of plumbing tools. It’s just a nice little bowl of soft, rubberised plastic that can fit neatly under a radiator. At each corner is a hole that is cunning sized to accept the sort of pipework that you’ll normally come across in a domestic plumbing system, namely 10,15 and 22mm. Just ease the appropriate corner of rubberised plastic around the pipe and relax as any wayward drips and leaks are directed into the bowl. Ok, the bowl isn’t the biggest so you might want to have a water vacuum pump nearby just in case the leak proves to be bigger than expected. It also doesn’t do 8mm pipework, or at least it’s not mentioned in the literature, which is a shame as a worrying amount of CH systems were plumbed in using 8mm pipework. That said, it's a perfectly handy pot for putting all your bits and bobs in after the job and it only costs a few quid, so why not give it a try anyway. I'm rather hoping that this will be a very short blog posting. Alas, there are bound to be some errors in the manual and as I find those that aren't just grammatical I'll list them here. These will all be fixed in the manual in subsequent editions. The diagram on this page shows two cylinders, a standard vented cylinder on the left and a thermal store on the right. 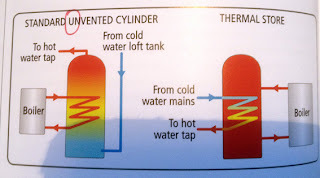 Sadly the title of the "Standard Vented cylinder" actual reads "Standard Unvented cylinder". 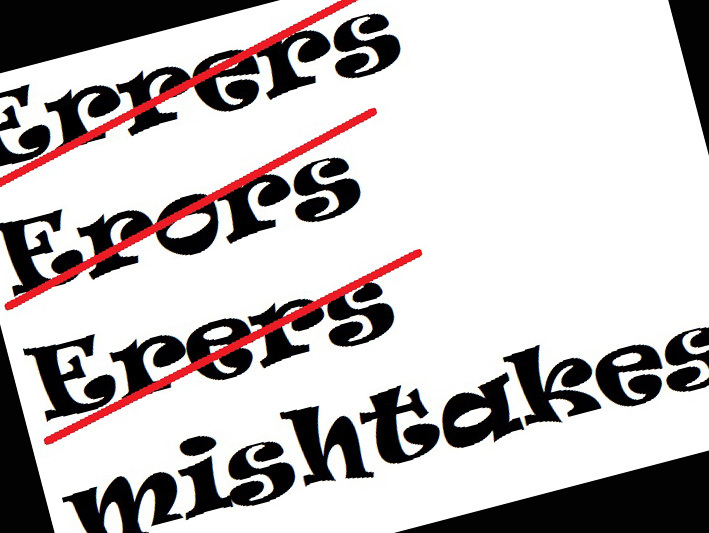 Oops! There are bound to be things that I either forgot to mention in the manual or just didn’t have the time and space to talk about in any detail. As I spot them I’ll mention them here in this single blog posting. If you find any yourself feel free to write a comment here or email me and I’ll write up something to cover that topic. I talk here about finding the tap that turns off just your high pressure hot water. What I didn’t mention is that this tap often turns off some or all your cold water as well. Why would it do that? Well mixer showers, for example, work best if the hot and cold water enter the shower valve at exactly the same pressure. In a high pressure system this is usually the case anyway but it isn’t guaranteed. For example, the maximum pressure of the hot water is restricted - usually to 3 bar – whilst the cold water is left to roam wide and free to hit whatever pressure it feels like. It's unlikely that your cold water would routinely be over 3 bar, but it’s not unheard of and in this situation your mixer showers would start to act up as they try to deal with hot and cold water at different pressures. To prevent this happening the cold water for all the showers is often taken off from the combination valve attached to your hot water cylinder. 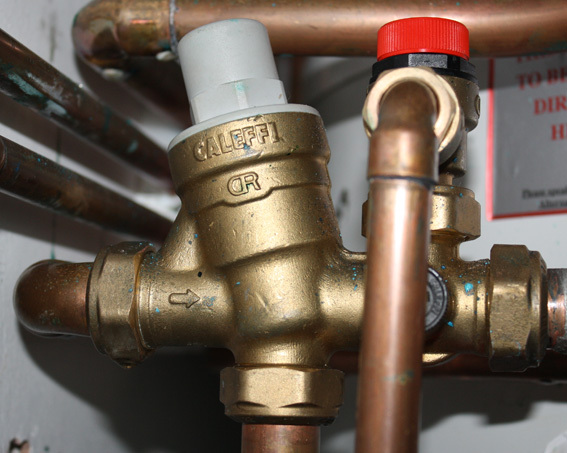 This valve is where the pressure reduction of the hot water takes place and as such now ensures that both hot and cold water are at exactly the same pressure. From a homeowners point of view this is no big deal but the fact that I didn’t mention this might cause some confusion. Page 76 "Replacing the washer on the stop tap"